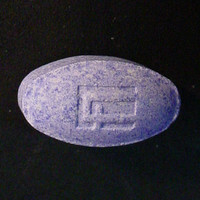 Submitter: Sold as Ecstasy with name 'Purple X'. Unknown what to expect it to be. EcstasyData: This looks like it might be a commercially produced tablet, though we do not recognize the logo.